Sometime in November, the proportion of humans on earth using the web will exceed 50%. Close to 4 billion people will have become internet “users”, bringing with them 4 billion sets of data. Tim-Berners Lee created the internet and gave it to us for free nearly 30 years ago. Now, he believes that this seminal mark calls for us to sound the alarm on how his invention is being used. For him, this onslaught of data is going to make the Web “more powerful, more valuable, and potentially more dangerous than ever.” (Brooker) It’s why he’s created Solid, a data platform that’s going to help decentralise the web, if we choose it to. Every interaction with our social media networks, Google searches and Amazon purchases creates pieces of information that live on in the web within the proprietary sphere of the platform they were generated on. To enter into a contract whereby we obtain a Facebook or Twitter account, we agree to surrender our data and have it reside in their “silos”. The amount of information contained within these databases is simply unfathomable, expanding from terabytes to petabytes with every user. It’s what makes data so “Big”. The issue is not so much with how Big data is- data being Big is tremendously important for our research. In our policy making and our innovation as a society, it constitutes “a key component of the next phase of the knowledge economy”. (Gitelman 20) Indeed, Berners-Lee adamantly believes in our rights as citizens to raw data and its potential in bettering the world. 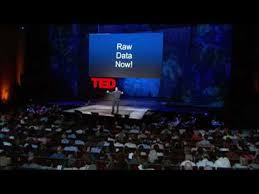 In a 2009 Ted Talk, he passionately gets the audience to demand “Raw Data Now!”. When Berners-Lee demands access to raw data, he predicates his argument on our constitutive rights as citizens and tax payers. For him, liberating data from centralised silos is fundamental in his endeavour to “reclaim the Web from corporations and return it to its democratic roots.” (Brooker) Unfortunately, in the nine years that have passed since Berners-Lee’s speech, it has merely grown increasingly apparent that “if data are somehow subject to us, we are also subject to data.”. (Gitelman 2) In the wake of the Cambridge Analytica scandal, we are reminded how far-reaching the effects of surrendering our data to are. Now, with Solid, the Decentralised Web movement wants us to gain control once again. Solid wants us to build solid foundations for democracy. Instead of allowing our data to reside out of our hands, the Solid platform works by allowing each user to store their data in a personal online datastore, or pod. (Mansour et al) Data will belong to the user and therefore gaining access will depend on applications authenticated by Solid requesting access to their data. A user’s data will be uncoupled from the application, and it will be up to the user to decide what sets of data they will allow to be shared with which applications. They can choose to distribute their data into a set of pods, and therefore select which pods applications will have access to. This vision of linked data allows interoperability of data without centralisation or hierarchies between the data rich and the data poor. The next step will not be dependent on infrastructure, but mindset. It’s a hurdle Berners-Lee is very aware of. He states in an interview with The Guardian “We are so used to these systems being manipulated that people just think that’s how the internet works. We need to think about what it should be like.”. (Solon) If we want to change our relationship to Big Data, there is a near insurmountable ideological hurdle that stands in the way first. Data has become not just an information tool, but an ethic, a principle of the sharing economy. Data is constantly and seamlessly being incorporated into our lives, and laws and regulations are creating landscapes in which data openness and sharing is seen as a democratic tool, even though Cambridge Analytica has shown us differently. In this sense, we all actively remake “our material, technological, geographical, organizational, and social worlds into the kind of environments in which data can flourish… enter[ing] into a symbiotic relationship with data”. (Ribes and Jackson 152). Nervertheless, Solid asks, what if we gave citizens the choice? The fundamental question we need to ask going forward is whether democracy has become skewed and so aligned with our vision of technology and data that any innovation would be predicated on data sharing as democratic principle. The platform allows us to reconsider questions of democracy and citizen identity in the age of Big Data. Would civic responsibility still follow the principles of data sharing set by Big Data? Or would concerns over privacy and surveillance be prioritised? In an age where Big Data represents a 21st century social contract, Solid introduces radically new ways to own our data, and somewhere along the way hopes that we begin to conceptualise new ways too. Gitelman, Lisa. (ed.) 2013. Raw Data Is an Oxymoron. Cambridge: MIT Press. Manovich, Lev, “Trending: the promises and the challenges of big social data”, in Debates in the Digital Humanities, ed. M. K. Gold, The University of Minnesota Press, 2011. [Online] Available at: http://manovich.net/index.php/projects/trending-the-promises-and-the-challenges-of-big-social-data [Accessed 15 September 2018]. Mansour, Essam, et al. “A demonstration of the solid platform for social web applications.” Proceedings of the 25th International Conference Companion on World Wide Web. International World Wide Web Conferences Steering Committee, 2016. Ribes, David, and Steven J. Jackson. “Data bite man: The work of sustaining a long-term study.” Raw data” is an oxymoron MIT Press, 2013: 147-166.